On Tuesday, November 13th, Todd started sanding the wood on the bow of the boat. He had put Cetol on it last fall but wasn't happy with how it was holding up, so he decided to take it back down to bare wood and start over. After a morning fishing trip with Rick, during which they caught a few white bass, Wednesday consisted of more sanding by the Captain and laundry day for me. That evening, the "B" dock crew (all ten of us) went to the Red Barn for dinner, courtesy of Buell who wanted to express his appreciation to everyone for taking him under their collective wing since his wife passed away earlier this year. The Red Barn is generally noted for being the best restaurant in Demopolis and that night was no exception. While there, we learned that it was Pete's 67th birthday so Rick arranged to have the waitress bring him something sweet to celebrate. The "B" dock crew with our host Buell on the right. Birthday boy Pete blows out his candle. When we returned to the Yacht Basin, we walked over to the New Orleans Bar & Grill with Rick & Peggy to have a nightcap and then retired to the boat. The rain we had been expecting hit overnight on Wednesday, and Thursday turned cold and windy. I went to town late Thursday morning to get my hair cut and then Todd and I went that afternoon to look for a new couch for the salon. Unfortunately, the furniture stores didn't have anything small enough to fit in the amount of space we have available. We had looked in to having our current couch recovered but thought it was terribly expensive, so we were hoping to find a replacement. So far, no luck. That evening we had dinner with Rick & Peggy and watched "Ocean's 13" and "Norbit" while eating Peggy's homemade pecan and coconut pies. On Friday Todd helped around the marina while I fixed a big pot of chicken noodle soup to take over to Fred's that evening where we watched Fred's favorite movie, "The Last Samurai" starring Tom Cruise. If you like action and "Braveheart" style fighting and haven't seen it, you're missing out! Todd spent some time fishing for crappie off the fuel dock on Saturday and then went for a ride with Rick & Peggy aboard "Rollin Tide" after helping them pump out. Then it was back to working on the bow, sanding and taping it off. We also spent some time re-caulking around a couple of the front windows, with Pete's assistance, in an effort to eliminate a few pesky leaks. Todd mans the pump-out station featuring "Rollin Tide" with Rick doing the dirty work and Peggy supervising from the sun deck. Todd and Rick went fishing Sunday morning and got back around 10:30, just about the time it started raining. That afternoon the "B" dock crew went to Buck's for an early dinner. Todd had promised to take Dale & Joy out to dinner as a thank you for Dale's help fiberglassing the sonar hole, and the rest of the "B" dock crew decided to go along. Carl & Sally went back to Kentucky the previous morning so there were eight of us who made the trek to Buck's, a local family-owned out-of-the-way establishment situated on the shore of Big Prairie Creek, just off the Black Warrior River. We anchored "Life's2Short" in Big Prairie Creek one evening last fall on our way back down the Black Warrior with Todd's mom and dad and had dinner there. None of the "B" dock crew had been there before so we thought they would enjoy the experience. Todd and Rick, the fishin' fools of "B" dock. The gang poses inside Buck's - wonder why they call it Buck's??? Monday was a beautiful, sunny day so we worked some more on the bow and got the first coat of Cetol on it. I then spent most of the afternoon making seafood lasagna to take over to Fred's that evening where Pete and Buell planned to join us. Unfortunately, Pete received a call from his wife Geneva earlier that day and had to make an unexpected trip back to Missouri. Buell appeared to enjoy himself, though, and we enjoyed hosting him for dinner (in Fred's house). Tuesday was another beautiful day and Todd went fishing that morning while it warmed up and dried off enough to put a couple more coats of Cetol on the bow. Rick then volunteered me to babysit his daughter's new kitten that afternoon while he and Todd went fishing. That evening we went over to "Rollin Tide" to watch Bruce Willis' new movie, "Live Free or Die Hard," the fourth in the action-packed never-a-dull-moment "Die Hard" series. The Captain slaves while the Admiral looks on. Both the Admiral and the Captain hard at work applying Cetol to the bow. Rain was forecast to move in on Wednesday so we didn't attempt to apply any more Cetol to the bow. I went to get my permanent crown affixed Wednesday morning and then made a run to Wal-Mart - not a good move the day before Thanksgiving! Todd occupied himself by helping out around the marina and I spent the afternoon preparing dinner for Rick & Peggy. We walked up to "The Wall" later that evening and visited with Bobbi & Keith who are back from Florida. They had planned to move to Kissimmee but have since returned to Demopolis, sold their houseboat and, at least at this point, plan to stay here for a while. A beautiful shot of the western sky Wednesday afternoon at the Yacht Basin. By Thanksgiving morning the weather had turned cold and blustery. Todd left shortly after 8:00 to go visit with Fred's dad, Roger, and brought back a big bag of pecans from Roger's pecan tree. Those will certainly come in handy - thanks, Roger! We had our boater's Thanksgiving Day get-together in the Boater's Lounge at 3:00 p.m. and had a good turnout (fifteen that I can recall), even though most of the "B" dock crew had dispersed to other locations for the holiday. The meal was absolutely wonderful and we ate far too much, but man was it good! Friday was also chilly and breezy but the sun was shining and it turned out to be a pretty day. Since we were planning to leave the Yacht Basin on Sunday, I did the "last chance" laundry while the Captain made other departure preparations, including installing a new generator battery. We had Thanksgiving Day leftovers in the Boater's Lounge late that afternoon and hung out and visited with Dale & Joy and Steve who is in the dry dock lot waiting for the weather to cooperate so he can do a bottom job before heading south. When we came back to the boat, Todd got out our meager Christmas decorations and put the big red bow on the front of the boat and the candy canes on the antennae. I guess that means it's time to get in the Christmas spirit! Rick & Peggy came over for a late breakfast Saturday morning and then we all went over to Fred's later that afternoon to watch the Alabama vs. Auburn game Saturday evening. Once again, we had massive amounts of food and stuffed ourselves as we watched Alabama lose to its biggest rival by a touchdown. The weather was supposed to turn nasty Sunday and Monday so we put off our departure until Tuesday morning. Since we didn't have any plans for Sunday, we decided to go to Tuscaloosa with Rick & Peggy to do a little shopping and have lunch at The Olive Garden (we haven't had enough to eat lately). We even stopped at the Dari Delite for ice cream before heading back to Demopolis! The rain began Sunday evening but the bulk of the storms moved off to the east and missed Demopolis altogether, so we will wrap up our final "to do" list and leave the Yacht Basin early in the morning, November 27th. We have about seventy miles and one lock to do tomorrow so the plan is to be underway by 7:00 a.m. Tonight we will get together with our friends from "B" dock and go up to the restaurant to say good-bye to the waitresses and locals at the New Orleans Bar & Grill. If our current agenda holds true, we will not be back in Demopolis by boat for two years so it will be a sad departure for us. We may just have to make a road trip back here between now and then! We returned from Missouri Thursday evening, November 1st. While we were there, Todd and my dad spent quite a bit of time fishing for crappie and caught ninety-six between them! The size limit for crappie at Lake of the Ozarks is nine inches but most of the fish they were catching were between ten and twelve inches, which is big for crappie. Todd also helped dad with several projects around the lake house while mom and I did some fall flower planting. My brother and his wife (Dewayne & Pennie) also came up for the weekend and mom made her famous homemade black walnut ice cream. This is one of my dad's pet chipmunks. He has trained them so that when he rings a bell, they come to the feeding place, jump up on him and crawl into his hands to eat sunflower seeds! He can only get two to come at the same time and he has to keep them separated while they eat or they will fuss at each other. If a third one comes around while they are eating, they will run him off! I guess they decided Todd was okay, too. They won't really let you play with them, but they will let you pet them while they cram seeds into their jaws! One day my dad was working on installing some deck railing and he hadn't had much time to feed the chipmunks, so one of them came up to him as he was working, jumped on his belt, then jumped off and ran over to the feeding place to let dad know that he was neglecting them. Pretty hilarious! When we got back to the Yacht Basin Thursday evening, the marina was literally packed with transient boaters. I think there were twenty-two transients in that evening and they were rafted at least three deep everywhere possible! We met Fred (the marina manager/owner) and Trenella (the fuel dock manager) at the marina restaurant where they were having a bite to eat and trying to wind down from a long and very active day. On Friday Todd resumed bottom painting while I worked on removing the thick layer of dust that had accumulated inside the boat. Todd went fishing with Rick Saturday morning and then did some more bottom painting and buffing/waxing while I got caught up on our laundry. We went over to "Rollin Tide" late Saturday afternoon to watch the Alabama vs. LSU game with Rick & Peggy. Peggy prepared a feast of shrimp (boiled and scampi) accompanied by cole slaw and french fries. At half time we walked up to The Wall where a large number of boaters, both transients and dock regulars, were participating in the Saturday evening get-together. We finished watching the game on "Rollin Tide" and, unfortunately, Alabama wasn't able to pull off a victory even though they put up a good fight. Todd finished buffing and waxing Sunday morning before going over to Fred's for a fish fry with Fred's dad, Roger. We wanted to share some of the crappie we brought back from Missouri and Fred and Roger both enjoyed the fresh fish. Sunday afternoon we spent some time at The Wall visiting with our B dock friends and then went back over to Fred's that evening to watch a movie called "The Guardian" starring Kevin Costner. Our good friend Fred poolside with the Admiral. I thought he was going to throw me in! Fred with his dad, Roger, and Roger's dog Ling. The Captain and the Admiral in Fred's beautifully landscaped back yard. Fred came over with the travel lift Monday morning and put the boat in the sling so we could finish bottom painting where the blocks and stands were. That afternoon we went over to the restaurant to have a drink with Becky & Keith and spent some time visiting with Ed and Cliff and other locals we've gotten to know. The Captain got creative with the bottom paint and added a shark face to the bow of the boat, below the water line, of course! It was only fitting to include an advertisement for DYB on the stern, even though only the fish will see it! Fred put the boat back in the water Tuesday morning and Todd and Rick took it out and ran it for a while to heat up the engines while I went to the dentist to have a crown replaced. Our friends Mike & Mary on the boat "WhatDazeIt" arrived Tuesday afternoon and we had another fish fry that evening for our B dock friends. Todd and Rick were in charge of the fish, Sally prepared the french fries, Peggy made hush puppies and Joy and I provided cole slaw. The evening was topped off with Mary's chocolate cake shooters, Godiva liqueur courtesy of Theresa (a transient boater on "Teta Doll"), Sally's brownies and Peggy's banana pudding. There were sixteen of us for dinner and a good time was had by all! Our fish fry gathering with the B dock crew and a few special guests. Pete appears to be hoarding the banana pudding and brownies as Buell looks on. It was 32 degrees Wednesday morning and it was nice to be back in the water so we could use our main heater! Todd told me that Fred needed some help cleaning the interior of one of the boats on A dock, so I volunteered and spent about five hours doing that while Todd served as the head "head" man in charge of the pump-out station for transients as they arrived at the marina. In the meantime, Mike worked on installing a battery monitor on our boat and spent some time showing us how it works and what it does. We had been talking about doing a casino road trip with Rick & Peggy and since they had to go to Mobile to run some errands anyway, we decided to ride to Mobile with them and go over to Biloxi to spend the night. We left for Mobile Thursday morning, had lunch at the famous Wentzell's Oyster House and then went on to Biloxi where we spent the night at the Grand Casino. We walked over to the Isle of Capri and spent a few hours there before stuffing ourselves on their seafood buffet and walking back to the Grand. At dinner, Todd entertained everyone by harassing some of the diners (especially me) for eating too many crab legs and giving the wait staff a hard time for running out of cheesecake. Fortunately, our waitress and the other diners all had a good sense of humor! Peggy's first cashout ticket on Wheel of Fortune. You go girl! While we were there, Rick took us on a brief tour of the Biloxi/Gulfport area pointing out things that "used to be" before Katrina hit more than two years ago. Even though several structures have been repaired/renovated and/or replaced, it is amazing how many things just aren't there any more. There are a number of empty lots with only foundations as reminders of the homes and businesses that used to be, and several structures that are still vacant and boarded up. This is what is left of the Broadwater Beach Marina. The hotel, which was across the road, was wiped out. This souvenir shop is still standing on the beach, probably waiting to be torn down. An oceanside view of the destruction. Friday morning we went to the Beau Rivage to try our luck there before returning to Demopolis. The Beau Rivage is a beautiful hotel reminiscent of the Bellagio in Las Vegas, though not nearly as large or grand. I think Peggy was the only one who walked away from Biloxi with more money than she came with, but we had a great time and enjoyed seeing a new part of the country. This is the Beau Rivage marina which still isn't open for business, although it appears to be very close. The Fabulous Foursome posing in the lobby of the Beau Rivage. Todd went fishing with Rick Saturday morning and then taped off and sanded the hand rails to prepare them for a few coats of gloss while I spent the day applying crack sealer to the cracks in the caulk between the strips of teak on the bow of the boat. That evening Rick & Peggy went to Jack's to get some barbecue and invited us over to their boat to watch the movies "Ratatouille" and "Delta Farce." On Sunday Todd went golfing with Keith while I put a couple of coats of gloss on the hand rails and applied more crack sealer to the bow. After visiting with the group at The Wall for a while that afternoon, we picked up a pizza from Mr. G's and went to Fred's to watch an interesting movie entitled "Next" starring Nicholas Cage. In addition to doing various odd jobs around the marina, as needed, Todd's big project this week is to refinish the wood on the bow of the boat. We are also expecting another influx of transient boaters this week since the November 15th insurance date (the date before which you cannot be south of Demopolis because of hurricane season) is only a few days away. 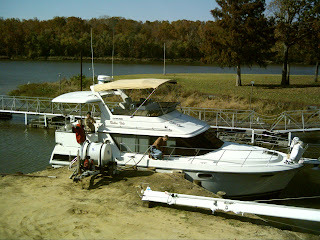 Never a dull moment at the Demopolis Yacht Basin!